Wednesday - day 1 of the challenge. Our Japanese mentor Rei Shiratori and the councillor of Fukuoka turned up with a few reporters this morning, waving Maltese and Japanese flags, ready to send off the team. For hours, the car park by the Fukuoka Institute of Technology was a hive of activity. The bikes were dropped off from Osaka airport and were immediately dragged out of their boxes, to be assembled by the headlights of the five back-up vehicles. It was a surreal scene. All the luggage and food were loaded jnto the van, and tool kits, medical supplies and check-point snacks into the others. Dozens of stickers were put onto the vehicles and breakfast was laid out. Cylists finished their own bikes and helped others. It was an amazing team effort. It paid off. Within two and a half hours, it was all done. The litter was cleared and binned, cyclists changed into their cycling gear, the ceremony was conducted, gifts were presented and off they went. There was a noticeable difference between the experienced cyclists and some of the first timers, who were far more wary, especially after weeks of being told how hard it would be, without the hundreds of signs normally used to show the route, going through busy traffic in anonymous towns. A few had hardly slept that night... This is not the quaint Japan of films with rice paddies and elegant kimonos. There was a brief section or two of the route through mountains and over bridges but most of the time was spent passing through busy towns, with heavy traffic and cartoons as logos on everything from restaurants to corporate offices. For the cyclists this meant a bewildering route, with many of them hesitating at complex junctions, in one case overshooting a turning and almost getting hopelessly lost. And this was just day 1! As planned, at the worst of the junctions one of the back up team stood by the side of the road wearing a fluorescent yellow vest to make sure they took the right turning. It worked and the only problems encountered were a few scraped legs - all par for the course. 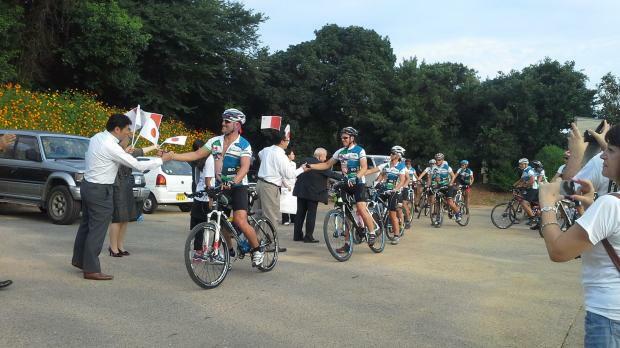 The 174km were completed by 6pm, after three check-points for food and water to ensure they got their daily ration of nearly 8000 calories. The night is being spent at a campsite in Yamaguchi, nestled in a valley by a lake surrounded by mountains - meaning a 15km uphill to end the day!! !